Origami is loved throughout the world as Japanese traditional culture and industrial art, and translated as it is in English. By using the characteristic that Origami structure is “light weight and stiff” or “deployable and foldable”, industrial application will be realized. 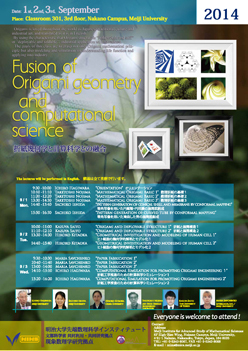 The goals of this class are to grasp not only Origami mathematical principle but also modeling and simulation for understanding life function and applying into industry.